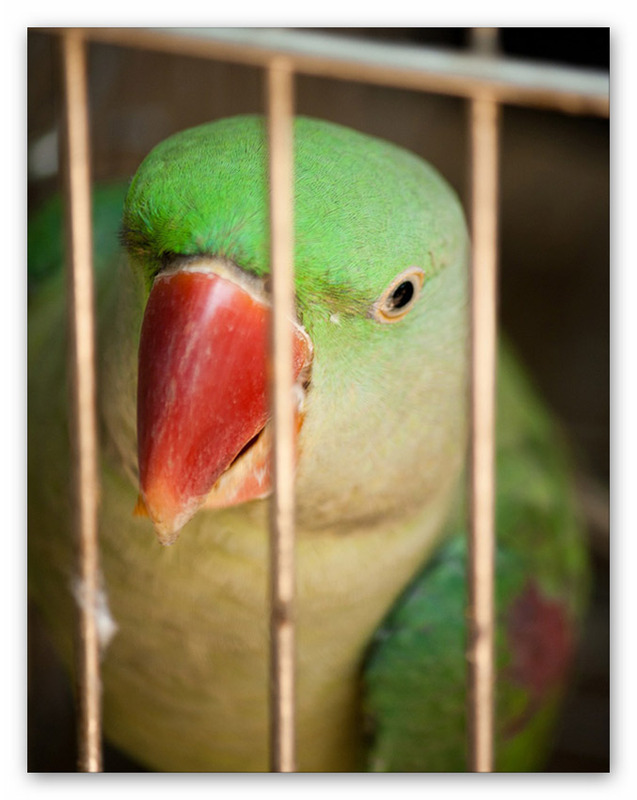 There is no such animal as a “cage bird.” All caged birds were either captured or bred in captivity. In the wild, these beautiful beings are never alone. If they become separated from their flock-mates for even a moment, they call wildly to them. They preen each other, fly together, play, and share egg-incubation duties. Many bird species mate for life and share parenting tasks. The evidence of their close companionship and concern for one another is plain to see. Unfortunately for birds, the very qualities that we find admirable and fascinating about them—their brilliant colors, speech capabilities, intelligence, playfulness, and loyalty—have made them the third most popular type of animal companion in the U.S. It’s estimated that 40 million birds in the U.S. are kept caged and often improperly cared for—bored, lonely, and a long way from their natural homes. Many people buy birds on impulse and don’t have a clue how much time, money, and energy is needed to care for them on a daily basis. Birds are as messy and destructive as puppies—something irresponsible breeders and retailers often won’t explain to customers. And unlike puppies, birds continue this behaviour for 15 to 75 years. Additionally, birds can be extremely loud and demanding and sometimes severely bite their caretakers. Because most customers aren’t prepared for an animal companion who is as curious, needy, and demanding as a 2-year-old child, countless birds spend their entire lives trapped inside a cage that’s too small in the corner of a living room, basement, or garage, unable to use or stretch their wings and deprived of the vital companionship of other birds. Like dogs on chains, caged birds crave freedom and companionship, not the cruel reality of forced solitary confinement for the rest of their very long lives. Driven mad from boredom and loneliness, caged birds often become aggressive, neurotic, and self-destructive. They pull out their own feathers, mutilate their skin, incessantly bob their heads and regurgitate, pace back and forth, peck over and over again at cage bars, and shake or even collapse from anxiety. Even if a previously caged bird comes into a home in which he or she is allowed a rich, active life, this behaviour persists and is extremely difficult to extinguish.